Elite’s Network Operations Center (NOC) is located in Lafayette, LA, USA. It provides customers with immediate responses 24 hours a day 7 days a week by staffed Telecommunications Electronics Engineers. Our NOC operators create trouble tickets and provide immediate engaged assistance. Escalation processes to supervisors/managers are in place. A group of satellite and IP engineers are available and the support team is available to dispatch an engineer or a spare device at any time. A Teleport engineer is available 24x7 in the Hub for any Teleport related issue to be resolved. 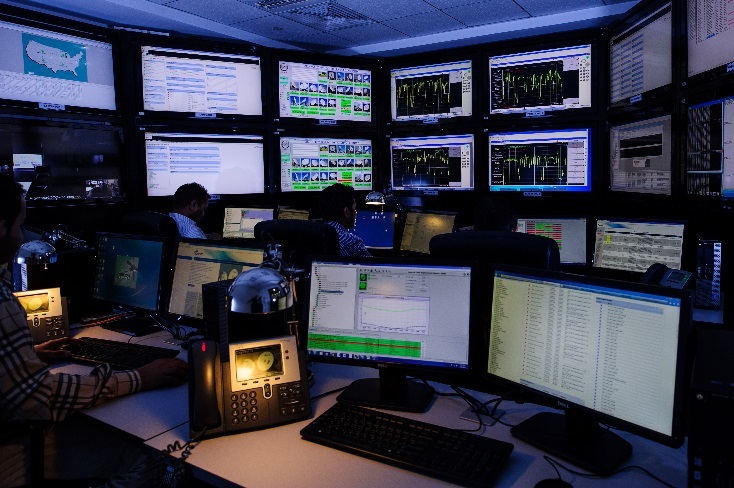 A specialized satellite, power source and TCP/IP (SNMP) monitoring system is incorporated within the NOC to monitor and control the entire network. This allows detailed satellite values and IP parameters to be displayed in real-time and recorded for further analysis. Remote devices are accessed in-band by using a console server connected to the local LAN. The NOC monitoring system also allows out-of-band access by using a local telephone line connected to a dial up modem, GSM modem, or satellite phone. This provides access to remote equipment in case of loss of in-band access. This provides proactive response to service degradations and failures. 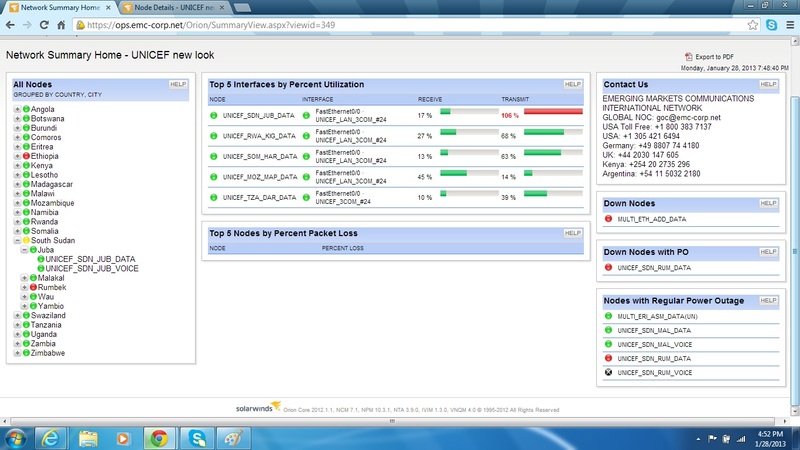 Elite has a centralized management system that includes Network Monitor and Control system based on WhatsUpGold and Orion. The routers are configured to enable IPSLA protocol which will perform specific tests to report the status and health of the circuit to the edge router. Each remote unit is polled through SNMP protocol and the information is treated in a separate monitoring VLAN that does not affect primary traffic. Elite began as a labor company. Since our inception we recognized delivering the best services requires that we have a sufficient number of qualified service technicians available. Field personnel are available for deployment 24x7 from multiple service centers in Louisiana and Texas and and are available for travel outside of those areas, if needed. For international work, Elite Technicians carry up to date US Passports and have passed the relevant health and backgrounds checks for obtaining work visas. Elite recognizes the value in having a technician force that is not just capable, but exemplary in all tasks expected of them. We also recognize the need in staying current with an ever changing industry. Therefore, we have made significant investments in continuous training and education for both new hires and existing employees, to ensure that tasks are done correctly and safely the first time, while minimizing or eliminating callbacks. Our field support centers are located in Lafayette, LA, Pleasanton, TX and Big Lake, TX. Each service center is equipped with spare parts, equipment, inventory and personnel to quickly respond to customer requirements for the installation, deployment, testing, repairing and maintaining connectivity services in remote areas. Our Virtual Help Desk can enable your company's IT department to outsource some of your technical workload by providing end-user support and troubleshooting. Our staff consists of courteous IT professionals, available 24/7, with decades of combined experience and numerous technical certifications. Our ticketing system allows you to review individual incidents/resolutions as well as statistics such as response times, resolution times and end-user satisfaction ratings. Competent Issue escalation immediately alerts you of issues requiring more direct intervention while avoiding lost time on day to day tasks, allowing you to focus on bigger picture goals. If you need more technical expertise, we also have experienced network engineers, analysts and project managers available for long or short term contracts. These can either work remotely or be deployed at your place of business depending on customer need.